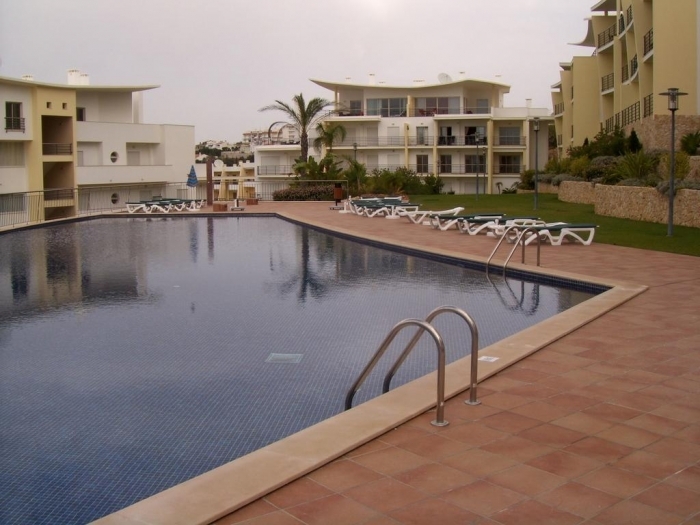 Apartments in Albufeira, Orada - Property for sale. Full Description: This 2 bedroom apartment is located on an outstanding private condominium situated on a hill overlooking the Albufeira Marina. In an excellent area close to the Old Town everything you need for an enjoyable holiday is just a short walk away. With outstanding architectural features the condominium is made up of 11 separate blocks built in a circle with pools and gardens in the centre. Built to a very high standard the apartment is located on the ground floor which is elevated so it has lovely views of the pool and gardens. The large entrance hall has fitted wardrobe storage, both bedrooms are doubles with fitted wardrobes and face East, one has access to a balcony. The kitchen is fully fitted and equipped with a full range of Zanussi appliances, granite worktops and splashbacks and has patio doors to the same balcony shared with the bedroom. There is a full bathroom with Jacuzzi bath and a lounge/dining room with large patio doors to a good size West facing sun terrace overlooking the pool and garden area. The apartment benefits from electric shutters, pre installation of air conditioning double glazing and security video entry system. The condominium is completely enclosed and is accessed through remote entry gates and the apartment has secure underground parking with space enough to convert part into lockable storage. Outside there are extensive landscaped gardens, salt water swimming pools with cascading waterfall and tennis court. This is a quality condominium and early viewing is recommended.